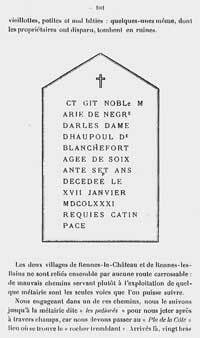 According to Gérard de Sède in his book the Accursed Treasure of Rennes-le-Château, Saunière defaced the tombstones of the Marchioness de Blanchefort‘s grave after he had decoded them to erase any evidence of a treasure. 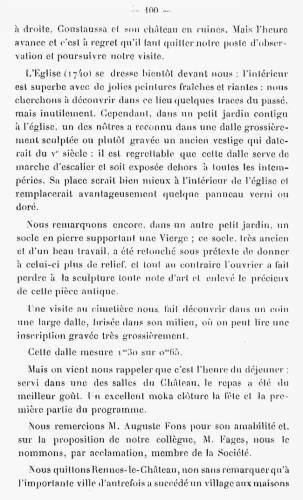 What great fortune then that a group of amateur archeologists headed by a certain Elie Tisseyre visited Rennes-le-Château in June 1905 and published a transcript of the vertical stone in the 1906 bulletin number 17 of the S.E.S.A. Group (Société d’Ã‰tude Scientifique de l’Aude). For a long time this document was without controversy. If Saunière indeed chiseled away the faces of the stones, he wasn’t in a hurry. He allegedly did his discoveries in the early 1890s. When the study group visited the domain 15 years later, the inscriptions were still there. There appears to be no obvious link here between the defacing of the stones and the discoveries. That is of course, if this bulletin is real and not a fabrication by someone with an agenda. Jean-Pierre Garcia of the Excellent Rennes-le-Château Archive website was perhaps the first to look at this document with a critical eye. There are some oddities with the report of the excursion. At some stage Elie Tisseyre writes: A visit to the cemetery made us discover a large stone in the corner, broken in the middle, on which we could read a very crudely engraved inscription. This stone measures 1m30 by 0m65. The picture of the stone in the bulletin displays no crack and the text is clearly readable. Artistic license one will say. It’s a bit messy as well. In the title it says 25th June 1905 which is contradicted in the second paragraph by stating it is the 24th of June. More troubling anomalies in the document are for example that the route that is described from the train station in Couïza passing the front of the Château of the Dukes of Joyeuse didn’t exist in 1905. 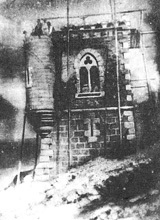 The Tour Magdala was far from finished and had no stairs yet in June 1905, still the group managed to climb this tower of recent construction and admired the panorama around them including the village of Couïza and the ruined Château in Coustaussa. 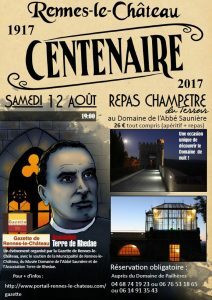 Everyone that visits Rennes-le-Château can see that it is impossible to see either of these from any part of Saunière’s domain. And there’s number 17 again. It’s bulletin number 17. It says the Church (1740), while 1740 is no special year for Rennes-le-Château, there is only an inscription in the wall of the church saying 1640. This document at least gives the impression that it was written much later by someone with just too little knowledge to create a perfect forgery. Almost all Rennes-le-Château researchers including Bill Putnam and John Wood in their great de-mystifying book Rennes-le-Château, a mystery solved, fail to spot this. The Elie Tisseyre report somehow has the label ‘genuine’ but is perhaps not very reliable as an eye-witness account. Or is it? 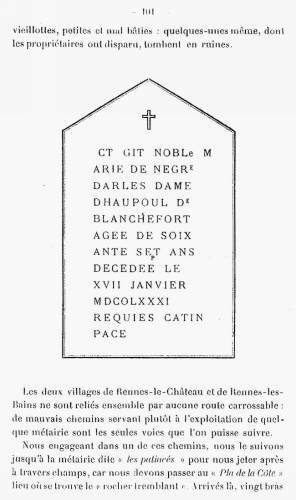 According to Gérard Jean, responsible for the archives at SESA, a couple of months after the excursion, one of its members living in Carcassonne returned to Rennes-le-Château and collected the stone from the cemetery to take it home. His heirs presented the stone to the Museum Lapidaire in Carcassonne in the 1980s to entrust it to their care. Since the stone held no special archeological significance, the museum wasn’t interested to add it to the collection. The stone remained with the family and still is with them today. It is said it looks exactly like the drawing in Bulletin 17, the only difference being that it is in two pieces. Every year the ancient town of Rhedae, or Rennes-le-Château as it is now called, sees an increase in the number of excursionists who come to visit its historic ruins – the ancient remains of days long past. The Société d’Etudes scientifiques de l’Aude could therefore hardly miss paying a visit to the town in order to search, in its turn, for a new page to add to the history of our département. 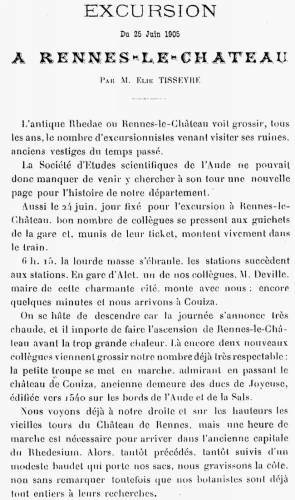 And so it was that on 24 June, the day chosen for our excursion to Rennes-le-Château, a goodly number of our members gathered at the ticket kiosks of the railway station and, armed with their tickets, boarded the train in high spirits. 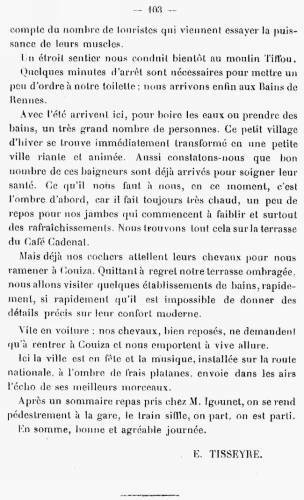 6.15 a.m.: the heavy mass of the train rattled and shook, station followed station… At the railway station in Alet one of our colleagues, Monsieur Deville, the Mayor of that delightful town, joined the party. A few minutes later we were in Couiza. We were in quite a hurry to get out of the train, as the day promised to be very hot and it was important to make the climb to Rennes-le-Château before the heat became too intense. At Couiza two new colleagues joined our party, which was already of a very respectable size. The little group set off on foot, admiring in passing the castle of Couiza, the former seat of the Dukes of Joyeuse, built around 1640 on the banks of the Aude and the Sals. 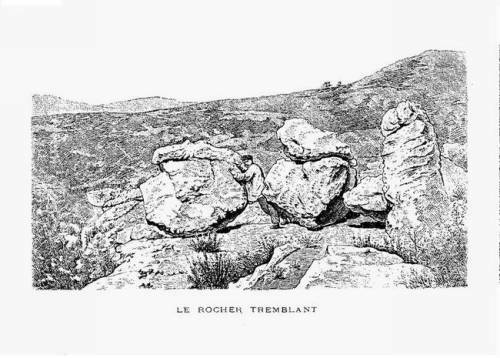 We could already see – to our right and on the heights – the ancient towers of the Castle of Rennes, but it was an hour’s walk before we reached the ancient capital of Rhedesium. And so we climbed the slope, sometimes preceded, sometimes followed by a small donkey that carried our bags for us. We could not help noticing that the botanists amongst us were already completely absorbed in their researches. 9.30 a.m.: at last we reached the summit. By now it was very hot, but at this altitude (435 metres above sea level) the air was still fresh. On our journey up we noted the ancient surrounding-walls or fortifications, of which only a few sections still remained. Storing our baggage in a safe place we began immediately with a visit to the Castle. Here, save for some large high-ceilinged apartments, there was nothing very remarkable to catch the eye; everything was old, decayed and, above all, dilapidated. Some of the rooms were still habitable, however, and, indeed, were being occupied by our luncheon host. So our visit was a very brief one. 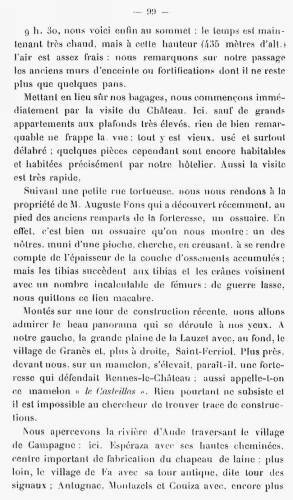 Following a narrow, twisting road we arrived at the property of Monsieur Auguste Fons, who had recently discovered an ossuary at the foot of the ancient ramparts of the fortress. And it was certainly quite an ossuary that was shown to us! One of our number, armed with a pick, tried digging in order to determine the thickness of the layer of accumulated remains, but tibia followed tibia and skulls jostled for space with a simply incalculable number of femurs – finally, weary from the struggle, we decided to leave this gruesome place. Standing on top of a tower of recent construction we were able to admire the beautiful panorama which unfolded before our eyes. To our left was the great plain of Lauzet with, in the distance, the village of Granès and, further to the right, Saint-Ferriol. A little nearer, straight ahead of us, there seemed to rise on a small hill the fortress that defended the town of Rennes-le-Château. Hence the name of the hill: ‘Le Casteillas’. But nothing survived there and it was impossible for the visitor to find any trace of any structures having been there. We saw the river Aude winding through the village of Campagne. There was Espéraza with its high chimneys, an important centre for the manufacture of woollen bonnets. Further on was the village of Fa with its ancient tower, known as ‘Le tour des signaux’ (‘the signal tower’). There was Antugnac, Montazels and Couiza with, even further to the right, Coustaussa and its ruined castle. But time was getting on and regretfully we had to leave our observation post and continue our visit. The Church (1740) soon loomed ahead of us. The interior was superb, with attractive paintings exuding freshness and charm. We looked for some signs of the past there, but in vain. But in a small garden adjoining the church one of us recognised a crudely sculpted (or rather engraved) tombstone as dating from the 5th century; it was unfortunate that this tombstone was being used as a step of a staircase and was therefore exposed to all the inclemencies of the open air. It would have been better if it had been placed inside the church where it could with advantage have taken the place of some varnished or gilded panel or other. We also noted, in another small garden, a stone plinth supporting a statue of the Virgin. This plinth, very old and of beautiful workmanship, had been retouched on the pretext of giving it a higher relief: on the contrary, in doing so the workman had deprived it of any trace of artistry and had destroyed the preciousness of this ancient piece of sculpture. A visit to the cemetery enabled us to discover, in a corner, a wide tombstone, broken in the middle, on which one could read a very crudely engraved inscription. This tombstone measured 1.30 metres by 0.65 metres. But then someone came to remind us that it was time for lunch, which was served in one of the rooms of the Castle. The meal was certainly of the better standard. An excellent mocha rounded off the festivities and the first part of our programme. We thanked M. Auguste Fons for his hospitality and, at the suggestion of M. Fages, elected him a member of the Society to a round of applause. Now it was time to leave Rennes-le-Château, but we did not fail to notice as we left it that the important town of yesteryear had given way to a village of antiquated, small and badly constructed houses: some of them – their owners now dead – were even going to rack and ruin. The two villages of Rennes-le-Château and Rennes-les-Bains are not connected by any roads which vehicles can use: rough paths serving rather for the running of a small farm are the only thoroughfares. Taking one of these paths we followed it as far as the small farm known as ‘Les Paliacés’ before plunging across the fields, as we needed to reach the ‘Pla de la CÃ´te’, where the so-called ‘Rocher Tremblant’ (‘the trembling rock’) was located. Once we arrived there, twenty strong arms embraced the famous rock, which, we thought, must surely tumble over with the tremendous force being exerted upon it, but the huge mass did not even budge – or, at least, hardly at all. To see the number of inscriptions, names and dates scratched onto the stone one could readily imagine the vast numbers of tourists who had come here to find out how strong they really were. A narrow path soon brought us to Tiffou Mill. Some minutes’ pause was necessary to enable us to smarten up. Finally we were back at Les Bains de Rennes. The summer sees the arrival there of huge numbers of people – to drink the waters or to bathe in them. What in winter is just a small village suddenly finds itself transformed into a charming and bustling small town. We noted that a large number of these bathers had already arrived for the sake of their health. What we needed at that moment was, first of all, some shade – as it was still very hot – some rest for our weary limbs and, above all, some refreshments. We found all these things on the terrace of the Café Cadenat. But already our coachmen were harnessing their horses to take us back to Couiza. Leaving our shady terrace with regret we paid a quick visit to some of the bathing establishments, so quick in fact that it is impossible to give any precise details about their modern comforts. ‘All aboard – quickly please’, came the cry. Our horses, now well rested, wanted only to return to Couiza, and they took us there at a lively pace. Here the town was en fête and the musicians, seated along the Route Nationale in the shade of fresh plane trees, were sending the strains of the choicest items from their repertoire into the summer air. After a snack at Monsieur Igounet’s we walked to the railway station. The train whistled, then began to move – and we were off! All in all, a very worthwhile and pleasant day.